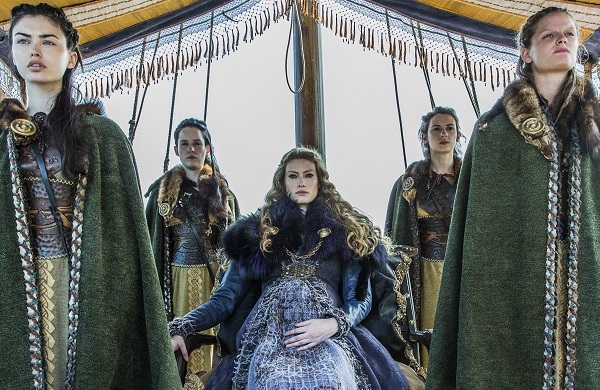 Vikings Season 2 sneak peek: Baby on board? What’s ahead on Season 2 of Vikings? New pictures suggest there’s a baby on the way and a marriage bed is divided. Uh-oh! Have you seen the new Vikings Season 2 promo pics? With the premiere just weeks away, the History Channel is offering up a little teaser as to what’s ahead and we couldn’t be more thrilled for the return of Ragnar, Rollo, Floki and Lagertha. Oh, and Princess Aslaug. Of course. Will Ragnar’s indiscretions with Lagertha threaten his marriage? Will Lagertha stay by her husband’s side or leave him? In episode one airing on [Feb. 27] Aslaug makes her way to Kattegat and brings with her a surprise that leaves Ragnar in a difficult predicament. Who will he choose? Looks like the princess will show up bearing gifts… of life. Apparently, even Viking wives had to deal with baby mama drama from time to time. Way to turn your life into an episode of Maury, Ragnar! The sexual and familiar issues won’t be Season 2’s only source of tension. History’s first official promo for the season, which was released around Comic-Con, also showcased a bloody battle in which Ragnar’s brother Rollo (Clive Standen) looks to be going after his best friend, Floki (Gustaf Skarsgard). This cannot end well. History’s Vikings premieres on Feb. 27 at 10/9c, and we’re being promised a season full of enough kinds of drama to keep everyone happy. What are you most looking forward to?